Many women think black is the best neutral default for clothing, but I prefer grey. It’s less severe than black, and less ceremonial, and grey coordinates with any number of colors — yellow, gold, red, green, peacock blue, pink — as well as setting off both white and black beautifully. So, when a garment comes in black and grey, I tend to opt for the grey version. Grey flannel is the pinnacle of work-wear, no? Well, maybe navy pinstripes are the pinnacle. But grey flannel is unimpeachably correct for professional dress. To make the look feminine, I’ve elected for a sleeveless grey flannel dress, paired with a wrap sweater. 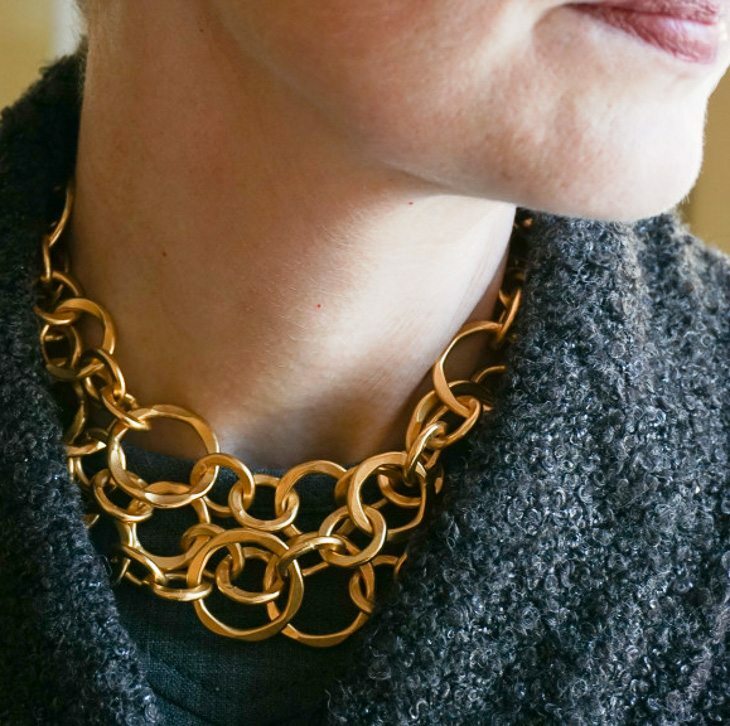 Two greys yield a monochromatic look — which I like — but rather than silver jewelry, gold creates a warmer, brighter look. A different sweater and accessories create a more relaxed, but still professional, look. The key to wearing a sweater over a dress is that the sweater must be cropped so that it hits at or above your natural waistline. A design that is cinched at the waist, like the grey wrap sweater, works, too. And of course I am not even showing the more obvious options for this dress. It could be worn as a sleeveless sheath or with a slim black turtleneck or crisp white blouse underneath. The mind boggles! Dress: Tory Burch; Boots: Kenneth Cole; Grey Sweater: L’Agence; Black sweater: JCrew; Necklace (which is actually a 36″ necklace and matching 7″ bracelet joined to create a strand that could be worn tripled): Stephanie Kantis; Black bag: 3.1 Phillip Lim; Red bag: Coach. Watches: Michele Urban with red alligator band; Michele Serein 16 with silver Saffiano band. I had not thought about gold with gray (grey), but it looks really pretty. Perhaps you were inspired by the cat’s gorgeous coloring? Love greys! They’re soft and full and cool, like a foggy morning. The advantage of black, however, is that most blacks play well with one another in a single outfit. But there are so many shades of grey (oh, dear, I really wrote that) that I worry about them clashing. Thoughts?